This week, a California magistrate judge ordered Apple to help the FBI access a cell phone belonging to the shooter in the San Bernardino terror attack. However, Apple has said they will not assist the FBI because they believe doing so could damage encryption for millions of other users. In today's society, we use smart phones, like the iPhone, to store incredible amounts of personal information, including private conversations, personal notes, and even our location. Apple is correct this information needs to be protected and I believe it is very important to respect people’s privacy. However, these terrorists committed the worst terror attack on American soil since 9/11 when they brutally murdered 14 people. I believe committing this horrific act removes all civil liberties and they should be investigated in whatever way is necessary. This is now an issue of national security and it is ridiculous that Apple is not participating in the investigation of known murderers and terrorists. This case highlights the need for a serious debate with the experts and there is no easy answer to this. If we ban full encryption, our safety and information is compromised. But if we do nothing, bad actors have an advantage and our national security is left at risk. Apple and other tech companies need to participate and help to develop ways to track, target, and go after the bad guys. I am confident these companies have the capability of creating a way to do this without infringing on the civil liberties of the American people or creating back doors for abuse. The Committee on Homeland Security, led by Chairman McCaul, has called for the formation of an independent Digital Security Commission. The Commission will assemble the brightest minds from all major stakeholder groups to conduct a deep-dive into the challenges of digital security, including encryption. The Commission will be tasked with developing recommendations for Congress on how to address issues like this while ensuring criminals and terrorists are not able to exploit the system. Monday, February 15, 2016: My weekend was the tale of two completely different climates. Friday afternoon and Saturday morning were spent in Des Moines, Iowa, where I spoke to the Midwest Pharmacy Association at their annual meeting and where the temperature was 5 degrees with a wind chill of -15 degrees. This was the first time I had ever been to Iowa and I am happy that I can now check it off of my bucket list. Saturday afternoon, I flew to Fort Lauderdale, FL, for the midyear meeting of the National Republican Congressional Committee where, needless to say, the weather was much different. There are no votes in Washington this week, and I am looking forward to being home for a district work week. Unfortunately, due to inclement weather in the Northeast, my flight out was cancelled and I had to rent a car and drive seven hours today back to Savannah. Fortunately, I made it back in time to attend the Skidaway Island Republican Club’s Annual President’s Day event where we heard from former U.S. Congressman Allen West. The retired U.S. Army Lieutenant Colonel represented the 22nd district of Florida from 2011 to 2013 and is a political commentator and author of the book Guardian of the Republic. A gifted speaker, Congressman West did an outstanding job giving his view of where we are as a nation today and what needs to change for us to continue our greatness. Tuesday, February 16, 2016: Today begins with a visit to Interstate Paper in Riceboro in Liberty County where I meet with my good friend Tom Norris, who is Vice President of the timber division, and members of his leadership team. This is one of the last independent linerboard mills in the U.S., and is not only one of Liberty County’s largest employers but also has some of the most dedicated workers around. Next, I head to Hinesville where I attend the weekly Rotary Club meeting where we hear from Savannah Technical College President, Dr. Kathy Love, and Liberty Campus Dean Lonnie Griffin, who share with the group the fine work that they are doing in Chatham and Liberty counties. From there, I head to Jesup where I tour the Federal Correctional Institution, a medium, low and minimum security facility that houses over 1,650 inmates and is led by Warden Victor Flournoy. This is one of two federal prisons in Georgia and is one of the best run facilities in the nation. The dedicated staff does an outstanding job and I enjoyed meeting many of them as I toured the facility and observed their medical ward, garment manufacturing area and training center where inmates are offered the opportunity to earn their GED’s as well as learn marketable skills that they can use once they are released. The dedication and work of many of our federal employees is truly impressive. I continue my trip down to the Southern portion of the district as I head to Waycross and Ware County for a meeting with newly elected Mayor John Knox and his staff before heading back to Pooler. Wednesday, February 17, 2016: I have a series of interviews today starting with an on-camera interview with WTOC in Savannah to discuss the recent tornado at Fort Stewart. David Klugh, the lead news anchor for the station, is doing an investigative report on what many believe is a dead zone in the Savannah and surrounding areas. With the National Weather Service having stations in Charleston, S.C., and Jacksonville, FL., the greater Savannah area is not getting the benefit of adequate radar coverage due to the distance from these locations. David does an outstanding job with the piece and brings out some great points that I intend to bring to the attention of National Weather Service officials. My next interview is with WSJ radio as we discuss the recent court decision by a California Magistrate Judge ordering Apple to help the FBI access a cell phone belonging to the shooter in the San Bernardino terror attack. This is a very divisive issue as we are all concerned with our privacy and we want our personal information safeguarded. While I understand and respect this feeling, as a member of the Committee on Homeland Security, I also understand how important our national security is and feel that this particular situation is a matter of national security. While there is no easy answer here, I am confident that if we all work hard enough we can find resolution. Thursday, February 18, 2016: This morning is a special morning as I stay in Pooler and visit the National Museum of the Mighty Eighth Air Force, which opened in 1996 and where I gave my first official speech as the then newly elected Mayor of Pooler. For many years, I served on the Board of Trustees of the Museum along side true American heroes such as General Lewis Lyle. As a Trustee Emeritus now, I always enjoy returning to the museum and am impressed with the job that CEO Henry Skipper and his staff have done with the artifacts and exhibits and especially enjoy seeing the continued restoration of the B-17 bomber that is on display. 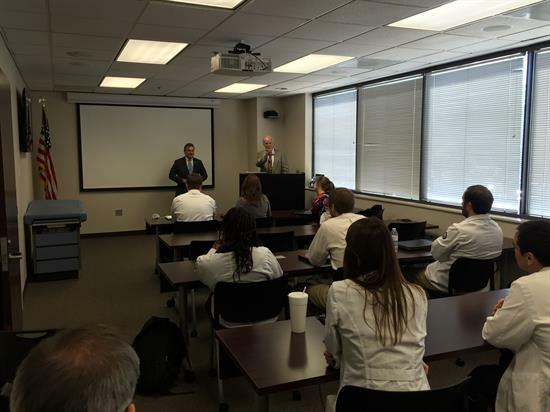 Later in the afternoon, I head to the Candler Hospital campus of the University of Georgia College of Pharmacy School where I have the opportunity to speak to the law class here as well as those in Albany, Athens and Augusta via satellite. Dean Ray Maddox and Clinical Assistant Professor Ken Duke are doing a great job in Savannah during their first year here. I always enjoy speaking to students and especially to Pharmacy students from my alma mater. Afterwards, I head to my Savannah office where I meet with constituents including a meeting with the new director of Chatham Area Transit (CAT) before I head to a ribbon cutting of the new office of Americans for Prosperity in Commerce Place. Friday, February 19, 2016: After delivering a Certificate of Resolution honoring the Band of Brothers on their 10 year anniversary that I had entered into the Congressional Record, I head to Baxley and Appling County where I spend the day touring Plant Hatch, Georgia’s first nuclear energy electricity-generating facility. Since it began operating in 1975, Plant Hatch has supplied more than eight percent of Georgia’s total electricity needs. This engineering marvel has two reactor units and employs over 950 of the most dedicated, skilled workers anywhere. Safety and security are of the utmost importance to this great operation that delivers reliable and affordable electricity to our area.